When Washington, D.C.-born Amii Stewart became an “overnight sensation” in the spring of 1979 with her rollicking dance floor rendition of Eddie Floyd’s 1966 soul hit, “Knock on Wood,” she managed a feat to which few divas of the day could lay claim: breaking the top 10 of the Disco, Pop, and R&B charts with one single. Atop the rousing production of Barry Leng, Stewart’s refined delivery appealed to a widespread audience with a combination of inherent soulfulness and dramatic prowess. In fact, the vocalist had been honing her chops for several years prior in a number of stage shows both stateside and in the UK, where she was discovered in a West End production of Bubbling Brown Sugar. Stewart found it difficult to repeat the across-the-board global success of “Knock on Wood” (which surpassed Floyd’s original in sales), but not for lack of a rich discography which has extended into the 2010’s. With many of her subsequent records having been released by various labels, there has yet to be a comprehensive collection of her work distributed on a large scale. A new British reissue, however, serves as a reasonable—if limited—presentation of a variety of her work via a slightly expanded edition of her 1985 album, The Hits (retitled The Hits: Remixed, with oddly revised cover art). Initially issued to capitalize on the European popularity of her 1984 comeback, “Friends,” The Hits presented a selection of tracks from the singer’s first three albums remixed—to varying degrees—in a fashion concurrent with the prevalent sounds of the day. Five years had passed since the supposed end of the disco era, during which she enjoyed her strongest commercial streak; thus, cuts such as “Knock on Wood” and her almost as big redux of The Doors’ “Light My Fire” were updated in hopes of resonating with a younger audience. 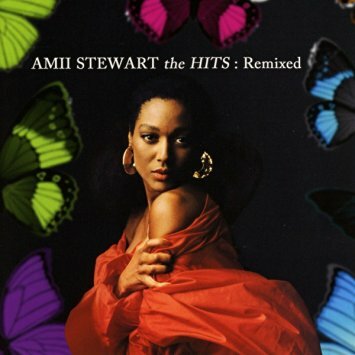 The Hits: Remixed might be intended as an initiation for fans of Stewart’s disco smashes who are largely unfamiliar with her other gems, but it’s not a completely well-rounded overview of her versatile range and penchant for musical dexterity. While the remixes of “Knock on Wood” and “Light My Fire” nicely preserve the feel of the original productions and highlight her dynamic presence well, there are several reconstructions which tend to stifle her performances a bit. The ethereal ballad “Paradise Bird” here is cluttered with vexatious sound effects that distract from her aerial reading of the disconsolate melody. Elsewhere, the sonic landscape is conspicuously generic on “Step into the Love Line,” an album track that should have been replaced with a hit such as “Great Balls of Fire” (the main charting single from the covered time period that’s absent from the compilation). Probably the most lasting impression is made on “You Really Touched My Heart,” which was, in fact, Stewart’s first single release in 1978. On The Hits, the first recording’s funky backbone is entertainingly translated into a synth-poppy affair quite fitting to the mid-‘80s. Despite the funk quotient being downsized, her voice still shines in a kinetic atmosphere that retains the lyrics’ sincerity and glimmers of hope. It’s unfortunate that the full 12” mix and instrumental were passed over as bonus tracks on this reissue, as they are certainly more noteworthy than the filler instrumental tracks “137 Disco Heaven” and “Ash 48.” On a flashier note, Stewart’s 1980 take on Mary Wells’ “My Guy”— performed as a duet medley with Johnny Bristol via the Temptations’ “My Girl”—is injected with lots of synthesizer work and extra guitars, while Wham! bassist Deon Estus replaces Bristol on the male vocal parts. Mind you, this was several years prior to Estus’s solo breakout with “Heaven Help Me.” His phrasing and ad-libs are commendable, although his overall appearance is not as strong as Bristol’s. Rounding out The Hits: Remixed, the stirring “Only a Child in Your Eyes” and frenetic “Jealousy” are exemplifications of Stewart’s interpretational diversity. The former makes more of an impact, as producer Leng wisely doesn’t toy too much with the tune’s unaffected arrangement—leaving plenty of room for Stewart’s vocal to breathe. The latter, however, is where the set falls shortest. Leng and collaborator Alan Coulthard turn what was a fiery Euro-disco adventure into a half-baked hi-NRG experiment rife with tacky voice manipulation and cheap programming work. It’s at this moment when the realization sets in that a proper ‘best-of’ spotlighting the original versions of Stewart’s late-‘70s/early ‘80s disco hits and some of her fine mid- to late-‘80s pop and R&B fare would be much more effective in shedding light on her impressive body of work in an array of styles. Cautiously recommended.